The service exists for the benefit and convenience of Newfoundland and Labrador. The gulf ferry service is no longer an Atlantic-wide service; it serves Newfoundland and Labrador. The views of provincial residents, therefore, must be central to the future direction of the service. There are many things that can be said about the Labrador ferry service. For starters, though, contemplate the symbolism inherent in this: the Sir Robert Bond connects one port in Newfoundland (Lewisporte) to two in Labrador (Cartwright, Goose Bay). What Would Chuck Furey Do, if the Caribou and Smallwood ran on Atlantic Time as "Ship's Time"? One would presume it is no big deal for most; otherwise more would have been done about it. 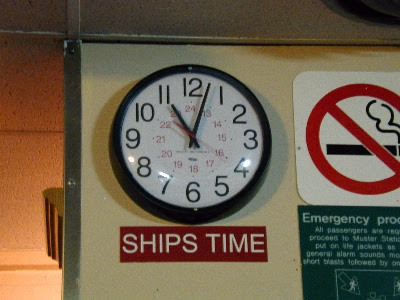 Or it could be if the clocks were changed the crew may get lost, as their 99.99% Newfoundland. Thanks for that bit of intelligence. Haven't been on the Ranger since her route was curtailed to ports Black Tickle and north, all of which are on Atlantic Time.